Much as we all love summer with its warmer weather, longer days and relaxed attitude, the temptation is great to take it easy and be a little lazy. Maybe you’re lounging around by a pool because it’s too hot to do anything else, hitting an outdoor movie with friends instead of your usual yoga class or indulging in a regular ice cream cone. Or perhaps you overdid it over this past weekend at a Fourth of July barbecue. Hey, I’m not judging—I do all those things myself! Not surprisingly, I see that the scale nudged up a little higher every August. This year, I vowed to make a change. I’m taking part in the Clairol 30 Day Refreshment Challenge. Each day, there’s a new, easy-to-follow fitness, nutrition or beauty tip contributed by bloggers (including yours truly! ), consumers and Clairol’s color director Marie Robinson. Follow along on the Clairol Facebook page and my twitter account (JSGAnne), and be on the lookout for my tips today. 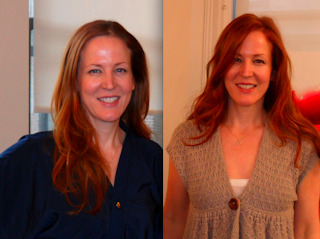 Speaking of beauty, one of the biggest challenges in the summer is to keep your hair color bright and beautiful. If you color your hair, like I do, you know that fading and brassiness is practically a fact of life in July and August no matter how diligent you are with wearing a hat and using sun-protection products on your hair. That’s why I’m a fan of Clairol Natural Instinct Vibrant Collection. Both the Natural Instincts demi-permanent and new permanent collection come with a Week 2 Color Refresher to revive faded hair color at that all important two week mark. Try it and let me know what you think!